On September 26, 2018, just two days after the ribbon cutting at Sentara Princess Anne Hospital (SPAH), Sentara Healthcare also celebrated the opening of the Reed W. Kelley Intensive Care Unit at Sentara Virginia Beach General Hospital (SVBGH). EOS Surfaces is proud to be a part of their ongoing commitment to the region and their continuous efforts to provide the latest and safest healthcare options for our community. To see photos of the new ICU and the EOScu applications, including sinks, countertops and bedrails, click here. The system’s decision to deploy EOScu Preventive|Biocidal Surface™, specifically patient overbed tables and bed rails, across all 13 hospitals in 2017 further revealed their dedication to doing all they can to keep patients safe. Furthermore, Sentara made EOScu its standard for horizontal surfaces - such as countertops, nurses’ stations, vanities, sinks, and charting stations – in all future renovation and new construction projects like the ones at SPAH and SVBGH. Their decision to specify the EPA registered, biocidal surfaces ensures that the surfaces in the patient rooms and surrounding areas are self-sanitizing, continuously reducing the bioburden of the patient environment. Our copper-impregnated hard surfaces, clinically proven to reduce hospital-associated infections at the Sentara Leigh campus in the world’s largest known clinical trial of copper in healthcare, are now considered Standard of Care throughout the Sentara system. We look forward to continuing to play a role in keeping our communities healthy. 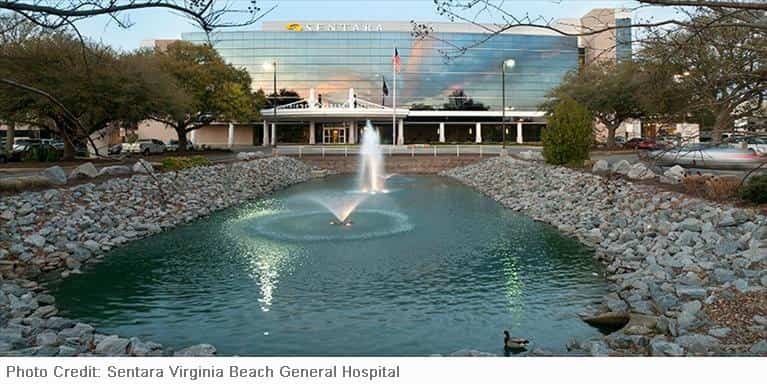 Future work includes Sentara Virginia Beach General modernization project.